Sen. Lamar Alexander, R-Tenn., seen here with Sen. Patty Murray, D-Wash., at a Jan. 18 hearing of the Senate Health, Education, Labor and Pensions Committee, says he'd like to see the individual insurance market fixed before repealing Obamacare. During the campaign, Trump promised to repeal and replace the Affordable Care Act immediately upon taking office. Last month, in an interview with The Washington Post, he said he had a replacement law "very much formulated down to the final strokes." But on Sunday, he dialed back those expectations in an interview with Fox News. "It's in the process and maybe it will take till sometime into next year, but we are certainly going to be in the process. It's very complicated," Trump said. He repeated his claim that Obamacare has been "a disaster" and said his replacement would be a "wonderful plan" that would take time "statutorily" to put in place. And then he hedged the timing again. "I would like to say by the end of the year, at least the rudiments," he said. Trump's recent hesitation comes as Republicans in Congress tame their rhetoric surrounding the health care law. 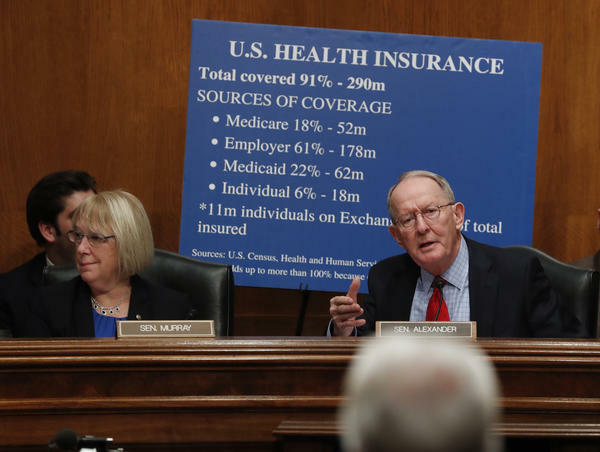 Sen. Lamar Alexander, R-Tenn., chairman of the Senate health committee, said he'd like to see lawmakers make fixes to the current individual market before repealing parts of the law. "We can repair the individual market, which is a good place to start," Alexander said on Feb. 1. He has also urged his colleagues to leave the other parts of the health care sector — Medicare, Medicaid and the employer market — alone. Throughout the campaign, and over the six years since the law passed, Republicans in Congress have vowed to completely repeal the Affordable Care Act. But in the time since the law went into effect, it has helped as many as 20 million people get insurance who didn't have it before, according to the Department of Health and Human Services. Just last week, the open enrollment period for 2017 ended and HHS reported that 9.2 million people bought insurance through the federal government's insurance marketplace — slightly lower than last year but still a large number. About 3 million more people likely bought coverage on state-run exchanges, based on enrollment in past years. In addition, about 10 million people qualified for health coverage because of the expansion of Medicaid in most states. That left Trump and Republicans, the day after the election, facing the choice of fulfilling their clear promise to repeal the ACA and the reality that doing so could leave millions of people without access to health care. At that time the public seemed to gain a new appreciation of the law once it was actually threatened with repeal. In recent weeks, several polls have shown that more people view it more favorably than they did before the election. Another reality Republicans have had to face is that, even though they control both houses of Congress and the White House, their ability to repeal the ACA is limited. That's because Democrats in the Senate can block bills using their filibuster power. But laws dealing with taxes and the budget are protected from filibuster, so Republicans can roll back many Obamacare provisions because they involve tax credits and federal spending. That leaves lawmakers having to build a new health care system that works within the general framework of the Affordable Care Act. They can get rid of subsidies to help people buy insurance, but the law creating government-run insurance exchanges, for example, will still be on the books. That's why Alexander and a handful of other Republicans are beginning to talk about repairing the current system. Currently, not enough young healthy people have signed up for coverage to offset the costs to insure sicker, older people. The result is that premiums have risen and insurance companies that lost money pulled out of many markets. But not everyone is on board. House Speaker Paul Ryan, R-Wis., said last week in an interview on Fox that repairing the health care system means "You must repeal and replace Obamacare."